According to Sports Hochi, Future Design Shibuya, an external organisation of Tokyo’s Shibuya ward, announced today (Thursday) that the new, proposed 40,000-capacity football stadium will be called the Scramble Stadium Shibuya, loosely referring to the busy pedestrian scramble the ward is famous for. Sports Hochi had earlier in the week (Tuesday) revealed that the Tokyo Metropolitan Government and the Shibuya ward, which is one of the 23 special wards that make up the core of the eastern side of Japan’s capital, are set to go ahead with a proposed private sector-led redevelopment of the Yoyogi Park to build a multi-purpose venue. The proposed venue will have a capacity of 30,000 or 40,000 spectators, and will be used not only for live concerts and events, but also as a purpose-built J-League standard football stadium, the first of its kind inside the special wards, as well as a disaster prevention centre. The plan was originally proposed by a number of private companies but the Metropolitan Government and Shibuya have now joined in the discussion to consider a possibility of relaxing regulations and restrictions. The site, Yoyogi Park, is on a publicly-owned property and is a designated scenic area and restrictions on height and size of the area mean that both the Metropolitan Government and the Shibuya ward need to relax their respective regulations in order for the arena project to be issued the planning permission. Possibility of using the arena as a disaster prevention centre, however, may just open the doors for the stakeholders to consider it as a necessary facility within the park, as the venue’s capability to store food and water for emergency circumstances has been discussed. 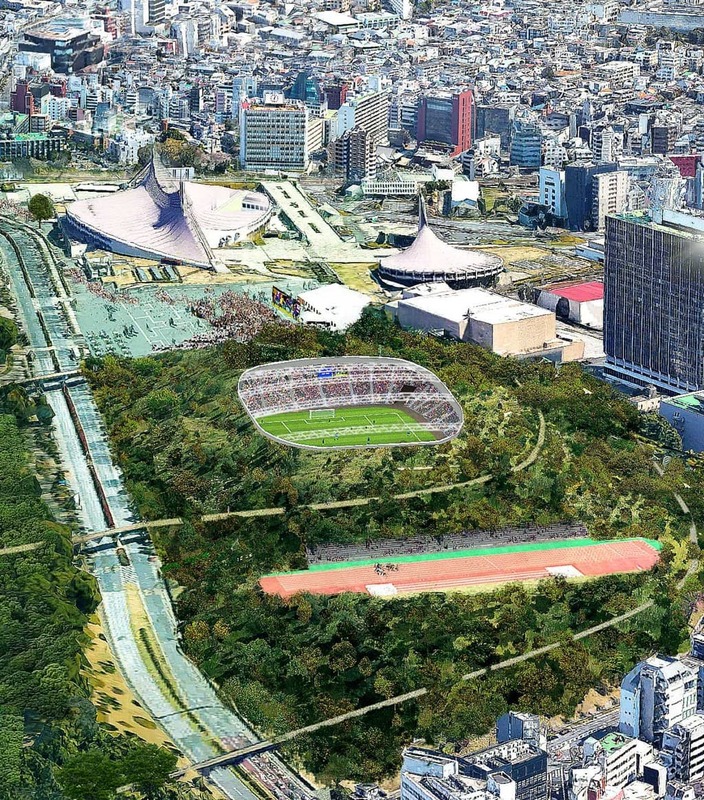 The cost of construction, expected to be around $270m to $360m, will be fully covered by the private investors, and the work was believed to commence at the southern part of the park without interfering the protected green area after the 202 Olympic Games in Tokyo. Despite the city’s huge population, Tokyo suffers from a lack of an arena that can host around 30,000 people for live entertainment and the music industry has long demanded such a venue to be built in the capital. Moreover, a number of high-profile ventures developing social gaming platforms are based in the Shibuya ward and this means that the venue may become a new centre for digital entertainment and events. The venue will also be used as a much-needed purpose-built football stadium with a portable pitch and may well become a new home of FC Tokyo who now play at the Ajinomoto Stadium in the city of Chofu, located in the central western part of the capital. FC Tokyo, one of three J-League clubs based inside Tokyo, boast a healthy average attendance of 26,490 (last year), second only to Urawa Red Diamonds. Their home stadium, however, is quite a distance away from the central business districts in the east, and has a running track which has been keeping the fans away from close action. The club, earlier this year, signed a multi-year sponsorship deal with an IT giant, mixi, Inc which was reported to be around $1.35m per year, and the Shibuya-based company is believed to be keen to sign a separate partnership deal to financially back the new arena project. If the reports are found to be true, then FC Tokyo has chosen the path to build and operate their own stadium instead of playing at an existing venue simply because Tokyo lacks appropriate stadia. Sports Hochi earlier this year reported that the club’s current home, Ajinomoto Stadium, was added as one of the venues for next year’s Rugby World Cup in Japan because the construction of The New National Stadium, built as the main stadium for the 2020 Olympic Games, was experiencing a significant delay. This meant the stadium will not be available for the J-League matches during the rugby tournament and no alternative venue would hold 25,000 people, the club’s expected average attendance, leaving them with no option but to play at the Komazawa Athletic Stadium, a significantly smaller venue with a capacity of 20,000 with no flood lights for night games. The club, to their surprise and frustration, was not informed of the non-availability of their home by the stadium’s operators until after everything was finalised, and now will have to live with the unavoidable loss of revenue over the two-month period. The New National Stadium, on the other hand, will be renovated to a football stadium after the Olympic Games and the Japanese Government has been encouraging J-League clubs to put their hands up to become an anchor tenant. The sheer cost of maintenance and management, estimated around $21.4m per annum, however, has kept the clubs having second thoughts about moving in. FC Tokyo, along with other Tokyo clubs, have therefore considered the National Stadium option unrealistic, and now are looking at building and managing their own stadium that can constantly attract spectators and revenues alike.